Happy Birthday to Shannon West! You may remember my posts from last month about the #imbringingbirthdaysback campaign, started by Shannon West of the Stampin’ Up! home office in Utah. Shannon started the campaign to send (and have more people send) birthday cards, instead of just the casual ‘Happy Birthday’ that has been appearing on everyone’s Facebook feed. I just love Mint Macaron – I hope Shannon does, too! I stamped the Birthday Blooms image in Archival Black ink onto Whisper White cardstock, and used my Blender Pen and Mint Macaron ink pad to add some shading. I then used my So Saffron marker to colour the middle stamen of the flower. I used the retired Fancy Fan embossing folder on a panel of Mint Macaron cardstock, then layered a piece of the Birthday Bouquet DSP on top of that. After attaching the panels to the card base, I cut the stamped panel into 3 pieces, and layered them on top. 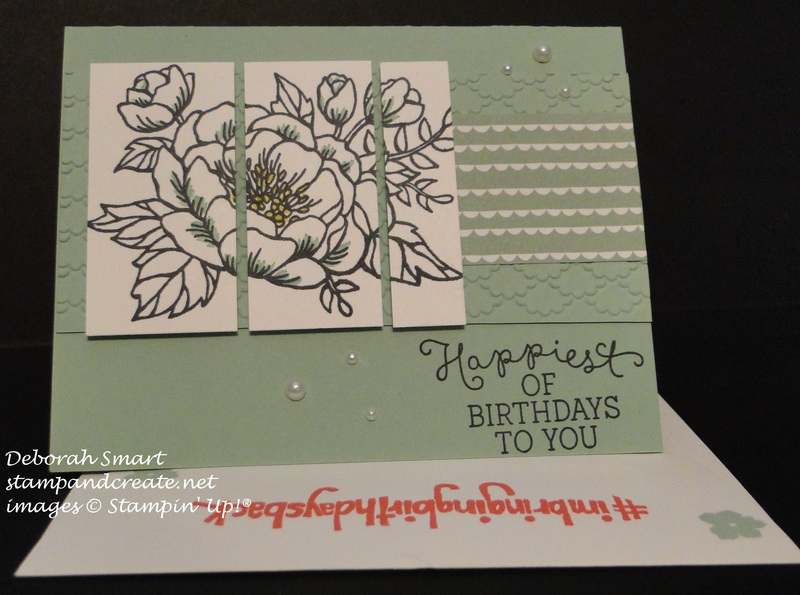 The sentiment is also from the Birthday Blooms set, stamped in Archival Black ink directly onto the card base. To finish off the card, I added some Pearl embellishments. And did you notice – I used Shannon’s own designed stamp with her #imbringingbirthdaysback hashtag on the envelope! 🙂 You can order one of these stamps for yourself – they are now a permanent addition to our supplies! You can order directly from my online store HERE, or let me know and I’ll be happy to place your order for you. Speaking of birthdays – I just held a fun class on Friday evening with 7 fabulous ladies, and it was all about birthday cards 🙂 Everyone made 6 cards, each a different design, and of course there was lots of laughing and chatting going on. After the cards were done, we all took a break to enjoy some cool drinks, and refreshing fresh fruit (it was a scorcher of a day on Friday!). I’ll be back tomorrow to share some of the birthday cards with you; in the meantime, I’m getting my posts ready for the upcoming challenges for the Watercooler Wednesday and Paper Craft Crew challenges. There’s still time for you to join in both of these challenges – I hope you’ll create a card, and join us!